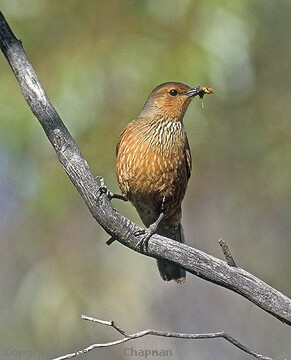 Rufous Treecreepers are really a western version of the widespread Brown Treecreeper of eastern Australia - their biology is very similar, both communal although family groups tend to be smaller in the Rufous Treecreeper. 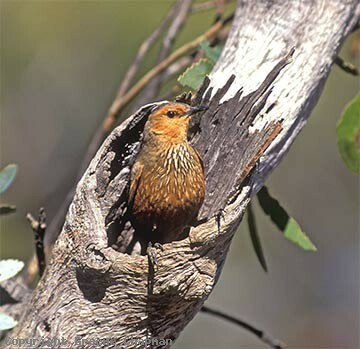 In far south-western Australia Rufous Treecreepers do extend into the taller, wetter forest presumably because there is no other treecreeper there - the White-throated doesn't occur in W.A. Rufous Treecreepers feed a lot on the ground, probably moreso than they do in the bark of trees and they eat a lot of ants. 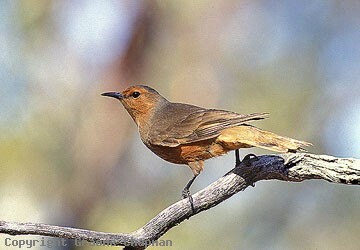 They live in permanent territories in a wide range of wooded habitats from mallee through to tall Jarrah forest. They range from near Geraldton through the south-west, across the edges of the Nullabor to Eyre Peninsula in S.A. where the birds are slightly bigger and brighter. 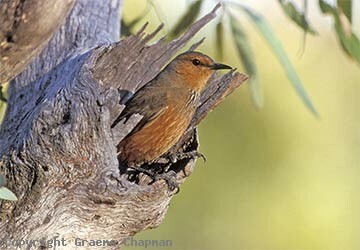 556203 ... Rufous Treecreeper, adult male, Yardea, South Australia.